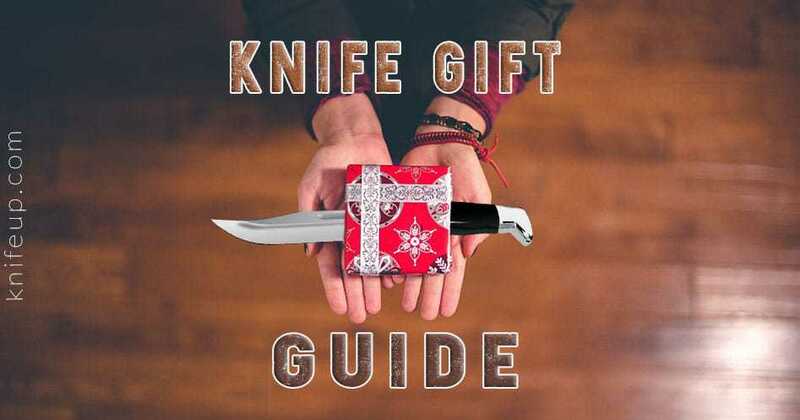 Best Gifts for Your Knife Lover! Okay, so I’m positive you don’t even really need me to tell you about the timeless nature of giving knives and knife-related gifts to those who matter to you in life right? Just in case I’m wrong, here’s a brief synopsis: Knives are a useful, enduring personal item which can be used daily or displayed as a collector’s items which can gain value. Knives are useful for everything from food preparation, to wilderness excursions, to self-defense, to pure entertainment! What other product can offer that type of versatility. Throw in its amazing ability to be customized inexpensively and quickly and “Voila”, you have the perfect gift! Oh, and did I mention that knives last forever, and the variety available will fit any age, gender and personality! Yes, that is my thought on the topic and I’m sticking with it! We’ve searched the world over long and hard to find the best products for a variety of knife lovers and collectors and after about 25 hours of hard labor, here’s what we’ve found! You’re Welcome! Here’s our Top 10 knife, tactical, EDC, survival, outdoors, security, food prep and wearable gifts! Whew! Is that enough? Need a gift that’s unique, unexpected, affordable and of excellent quality? (no duh!) 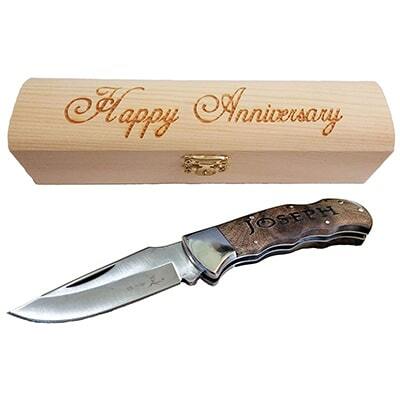 This knife is made of virtually rust-proof 440 stainless steel and its burl-wood handle can be engraved with up to 13 characters/letters. The best part is that it’s done usually the same day as you order it so the turnaround time is insanely fast! Because the price point makes this a top valued gift, it tops our list for this year! It’s not cheap, but think about this – it’s literally a once in a lifetime purchase of the best kitchen knife you’ll ever own. The best part is that unlike most other knives that a collector might accumulate, this knife will be used literally EVERY DAY! How cool is that? It’s made out of AUS-10 Super Steel with 67-layer High Carbon Damascus Stainless Steel. 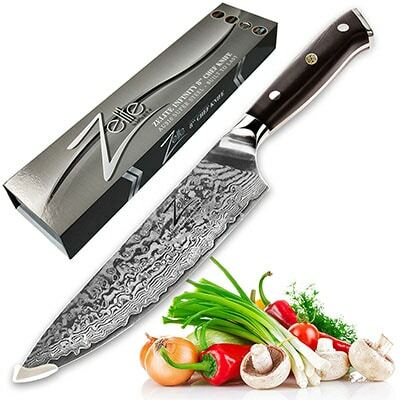 If you check online for knives made with Damascus steel, you’ll be shocked at the high prices. This one is an awesome deal. I would get it if my wife hadn’t already bought me an entire set of kitchen knives 2 Christmases ago! 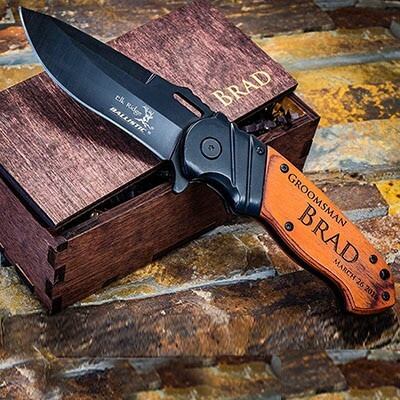 We have a second entry in the personalized knife space because knives are after all, what this is all about, and this is actually a pretty good deal! Check out these specs! 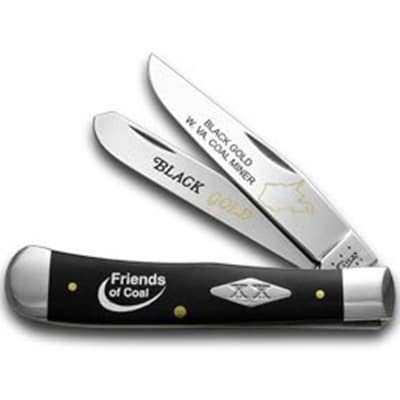 It’s got a 3.5″ blade made of 440 steel with black oxide coating. It’s a decent folding hunting knife which measures 5″ when closed. It has a very cool looking polished Pakkawood handle with clip. It’s set up with an assisted opening mechanism too! This Elk Ridge knife comes with a customized box with your choice of copy done in elegant gold paint (so it really looks legit, not done by some machine). Does Made in the U.S.A. mean anything to you? Well, this one’s made totally right HERE! Show your support for America and for those involved in one of the iconic professions that has put much of this country on its feet – The West Virginia Coal Miners! This is not just a good-looking tool! It’s made of Tru-Sharp Surgical stainless steel with a Black Delrin handle. It includes a collector’s edition box too. At 3.7 oz it’s quite manageable and of course, it has engraving on the blade that honors W. Virginia coal miners and the state of West Virginia. Okay, I’ll be honest. 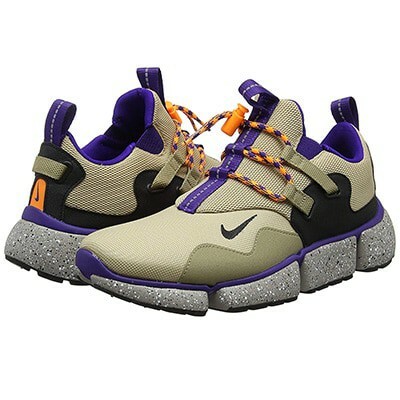 These Nikes made it to the list because of one thing (maybe a bit more)! Their NAME! How cool is it to have a pair of shoes that is of ultimate quality and functionality for daily use, AND it’s named after your passion and pastime! While it’s true this shoe is a stellar running shoe, it’s also true that its colors and shape make it work for more of a daily lifestyle shoe that doesn’t scream at you with neon colors. This is one very cool and unique products on the market today. Yes, it’s targeted for ladies but it’s amazingly useful for everyone! It’s designed for legally-restricted areas where locking knives are prohibited. It’s made of Austrian N690Co carbon steel blade. 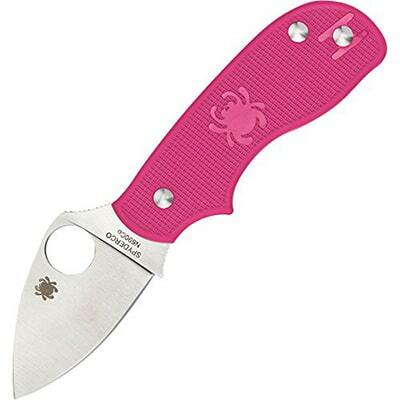 The pink handle is fiberglass reinforced nylon (FRN) and engineered for exceptional comfort. The blade is flat ground and I’m sure you don’t need to be reminded that Spyderco is arguably the single biggest/best name in the knife industry anywhere in the world! I had to include something that was actually as useful as anything you use every day! Enter the Stryke tactical pant. Sold by Five Eleven Tactical, this pant is made from a proprietary fabric called Flec-Tac and offers 2-way mechanical stretch fabric made of 65% Polyester and 35% Cotton. They’re made for harsh conditions so longevity is the goal with this pant. It features a Teflon fabric treatment to repel water and keep the pant looking its best. The waistband is self-adjusting and it has a fully gusseted crotch allowing for multi-directional movement without squeaking the junk. 12 pockets find a place on this pant and it comes in a variety dark and light colors that make this a potential “go-to” pant for everyday wear (so your EDC can by carried in this EDW!). 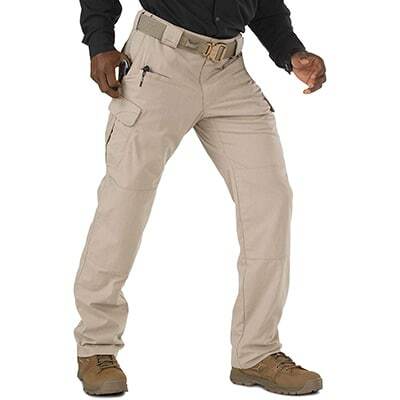 5.11 Stryke Tactical Pant is perfect for tactical, work and casual everyday use. Made by 3V Gear, this pack is in the big leagues of bug out bags! 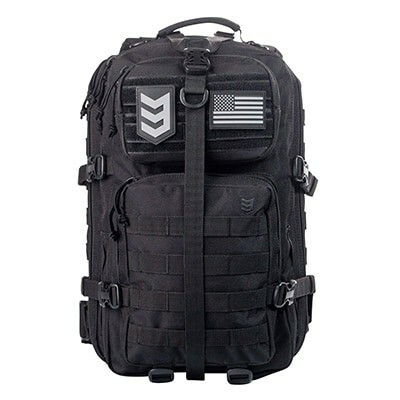 It’s officially a Tactical Assault backpack, but it fits the bug out genre as well as any pack on the market. With 1628 cubic inches of storage, there’s no shortage of space for survival gear or any day trip or expedition you may have in mind. It has very cool self-healing zippers and provides users with a clam-shell opening system for easy access. The 600 D PVC polyester adds to the weather-resistant qualities as well as adding ruggedness and stiffness (which is a good thing!). It’s even hydration bladder ready and has an insanely good lifetime warranty against defects! Yes, you can buy a cheaper pen online for $15 or so, but I wouldn’t bother. Why? Well, if you’re going to get something that you may rely heavily on for safety or security, I’d fork out a few extra bucks for this. I understand that with a big ticket item, great quality is simply out of reach for many people (including me about 99% of the time! ), but this is not a big ticket item! The Titanium construction and rugged built add to the price (around $45) and bolt action is not only cool (or sick or phat, or whatever word you want for the same thing!) but durable. 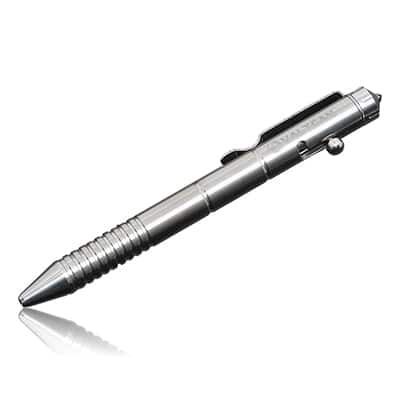 The tungsten tip facilitates tactical entry (escape from a car too). A super strong clip is included for EDC, and refills are easy to find (Schmidt P900 Parker style, the new Parker gel refills, Fisher Space pressurized refill, Rite in the Rain refills, and Valtcan 2V refills – need any more options?). It’s 5.5 inches long. The Valtcan Titanium Bolt Pen with Tungstun Tip is a tactical EDC pen with style and ultimate build. Is your drawer becoming a bit cluttered with small weapons? Any collector knows one of these is an eventual inevitability! You need a variety of tools to do the trick and your collection is getting bigger and more valuable. This knife roll was designed to organize, store and transport 7-8 knives (depending on if you’d like to store a sharpening stone). 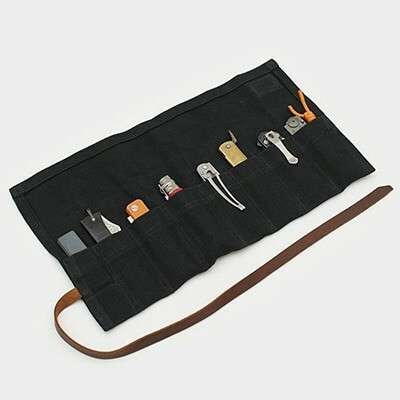 This California-made knife holder is made of waxed canvas and oiled leather to create the ultimate storage environment. Two thumbs up on this one! If you think this is the sickest thing on our list, then you’re not alone. I’m kinda a watch guy myself, but this is right up the same alley, and it gives me an excuse to wear something useful and intimidating on the other wrist! Put simply, the Tread LT is a bracelet that looks like something from a Mad Max flick with lots of tools including a variety of box wrenches, hex drivers, flat head and Phillips screwdrivers as well as Torx and Pozi drives, a square drive, a carbide glass breaker, sim card pick, bottle opener and a cutting hook. Guess what! I didn’t even mention ALL the items on this girl. I’ll leave that for suspense! The LT model is a bit slimmer than the original so that it can fit the needs of someone who looks less like Hulk Hogan and more like Alan Alda (like me). As you would expect, it’s also adjustable in its size (circumference) in quarter or half inch increments. And hey, it’s something you can take with you on the plane since it apparently passed TSA security regulations. The 25-year warranty is something tough to complain about too! Oh, and one last thing! It’s made in the USA! I think it’s one of only 75 or 80 products in the world still made within the continental United States!! 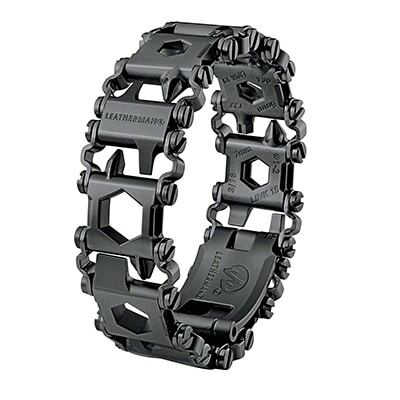 The Leatherman Tread LT Utility Bracelet. Arguably the coolest most badas$&@ product on our list! We hope you enjoyed our take on excellent (and affordable) gifts for the guy or girl in your life who shares a love for knives and outdoor adventure. Give us your ideas for even better gifts! We are all ears! (that doesn’t mean I look like Dumbo).